I found this fantastic site that's geared towards people like you and me ... only better. It's sort of like blogging and Pinterest rolled into one. It's called Hometalk. Here's what I love about it - it's where DIYers can come together to share ideas, get input, etc. Also, if you're not a blogger and you just want to share the projects you do, they have a very easy platform that walks you through uploading photos and adding text. I got into blogging to connect with other like-minded crafty types. I found that I was following a whole bunch of blogs but had nothing to offer them when they did link-up parties or just asked their readers to share similar projects. I knew I needed to bring something to the table so I started blogging. I'm not going to lie though, blogging takes time and commitment (which I don't always manage to find) but Hometalk really does make it easy so there's no excuse not to share. 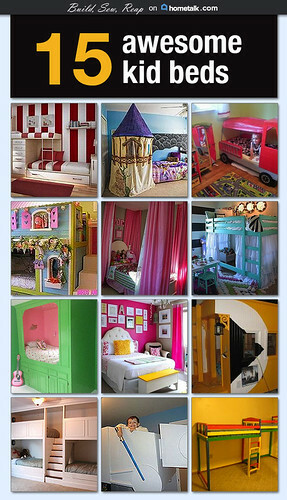 I've started adding some of my favorite past projects to posts on Hometalk but also created a board of awesome kid beds. If you've followed me for awhile (or dug back through old posts), you know that I LOVE creative kid beds. Come check out my board, join Hometalk, and be a part of the discussions going on over there. Seriously, can you tell me you don't want at least 1 of those beds?!? Now go surf through Hometalk. You're going to love it!